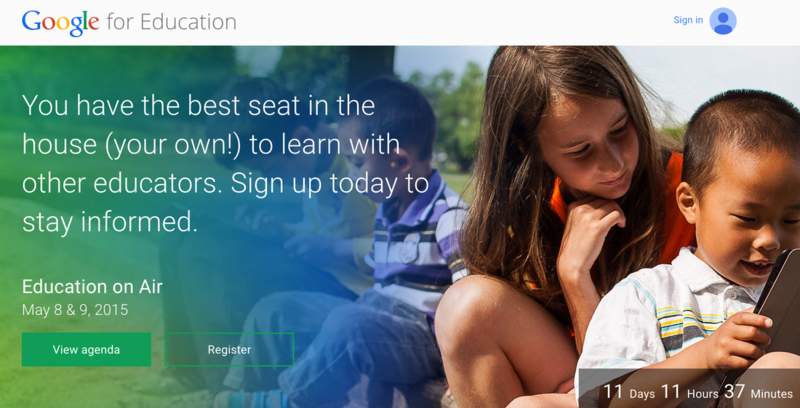 Don't Miss Google's Education on Air May 8th and 9th via Google Hangout! No one will argue that your classroom should be a positive place for students to learn. However, I feel that the way we grade and give feedback to students is often at odds with the positive classroom climate we desire. Below are some things I changed about the way I graded that made a positive difference in my classroom. One Lowcountry school is ditching library books and transforming their media center into a technology hub for elementary school students. NYC isn’t the only district trying to better its evaluation process by offering teachers concrete methods to strengthen their skills. Want to keep your technology support fresh and current? Keep learning! There is no better way to ensure tech is being used efficiently than through an approach of continuous professional development. Librarians are lifelong learners by nature. Whether it is the newest educational theory, the latest research methods, or the newest educational technology push, librarians love to learn and share new things. There’s a lot of debate about screentime for youth. Not only is it important for teachers to be familiar with the research, but Holly Flanders, CEO of Choice Parenting reminds us that parents, nannies, and any childcare provider must also be armed with accurate information. Flanders was recently quoted in the New York Post explaining why misinformation and misunderstanding can be a problem. “Most nanny relationships fail after a buildup of small issues that explode into something beyond repair.” The same holds true for parent-teacher relationships. Students need adults who will guide and support them as they navigate the complexities of relationships and online sharing. They need adults who can help them find answers and solve problems, and who understand that they’re going to make mistakes. Adults who will help them clean up the messes. Gene Wilhoit recently said, “We’ve given up on schooling; we need to shift to systems that enable high-quality learning and educational opportunity for all.” Gene describes three critical attributes of a system of personalized learning. Daniel Goleman, author of several books on the subject, says that the expanding hours spent alone with gadgets and digital tools could lower EI due to shrinkages in the time young people spend in face-to-face interactions. Your role in this game is to plan and construct a safer environment to your population. You must assess the disaster risk and try to limit the damage when natural hazards strike. Expect advice along the way, both good and bad. Are you ready for the future? Build your own sustainable city. Choose your energy sources. Play now to find out! When Flipboard invited magazine readers to create their own magazines, I jumped on the bandwagon and immediately began compiling my own. Most of my magazines are targeted for the education field. I believe Flipboard is the perfect tool for educators to create magazines for themselves, their students and colleagues. Here is how Flipboard can be used by educators. A safe, extensive, educational portal for kids. Find a wide choice of content such as interactives, sports, movies, and music in addition to traditional content areas. Our Formative Assessment Data Collection handout helps you keep track of each student’s level of mastery of a particular skill. This record sheet will help you know if additional practice or conferencing is needed for individual students or for the majority of the class. Formal grades should not be given until ample time has been allowed for instruction. This easy-to-use Microsoft Word rubric template -- created by Cait Camarata, Edutopia's visual designer -- can be modified to suit your own needs. It is also available in Google Docs format. The Golden Treasures of Google! The Fabulous Tools You Don't Know About! Part 3 - SEARCH! Below are some Google search engines, tips and tricks to help you sharpen your search skills. Check out The Golden Treasures of Google - Part 3 (SEARCH)! Below are some fantastic ways to let your students shine! These are great ways to tap into your students' creativity and prepare them for the future. Google+ was enabled for K-12 domains in the fall, and I am now thinking about how Google+ could fit into our district for both students and staff, especially in light of Skype’s recent offer for group video chat for teachers. Search for pictures with Google GogglesYou can do a Google search by taking a picture with your device using the Google Goggles app. Reverse image searchYou can use a picture as your search to find related images from around the web. If you have followed this blog for very long, then you know that I am a self-professed Chrome Addict. I love it! I love the fact that I can customize it to fit my needs, but I love it even more because we can customize it to fit the needs of learners! Below are just a few Google Chrome Apps to support readers in the classroom. These apps offer various ways find leveled reading material (by Lexile and grade level), as well as many other robust features!